Step 1 Heat the oven to 375 degrees. Grease and line the bottoms of 2 (8 1/2 - by 4 1/2 - by 2 1/2 -inch) loaf pans with parchment paper. Step 2 In a medium bowl, whisk together the flour, wheat flour, baking powder, baking soda and poppy seeds. Set aside. Step 3In the bowl of a stand mixer, or in a large bowl using an electric mixer, cream together the butter, three-fourths cup sugar and salt until light and fluffy, about 5 minutes. Add the eggs, one at a time, until incorporated. Step 4In a medium bowl, mash the very ripe bananas. With the mixer running, add the mashed bananas and vanilla to the butter mixture until incorporated. With the mixer on the lowest speed, add the dry ingredients just until incorporated. Gently fold in the yogurt and dates. Divide the batter evenly between the 2 pans. Step 5Slice the remaining 1 1/2 bananas crosswise into one-eighth inch slices. Top the batter in each pan with the banana slices, arranged in rows. Sprinkle the remaining teaspoon of sugar evenly over the sliced bananas, then place in the center of the oven (leave a few inches between the loaf pans). Step 6Bake until a toothpick inserted comes out clean, about 1 hour, rotating halfway through for even baking. Check the pans after 20 to 30 minutes and periodically after that to see that they do not darken too quickly; if they do, lightly cover the tops with aluminum foil and continue to bake. Step 7Cool the pans and unmold the loaves. Sift the powdered sugar evenly over the 2 loaves. Cut the loaves into 1-inch slices and serve. In Recipes-list.com we have selected the most viewed recipes from category - Breads Breakfasts Desserts . Enjoy the best recipes specially selected for you! 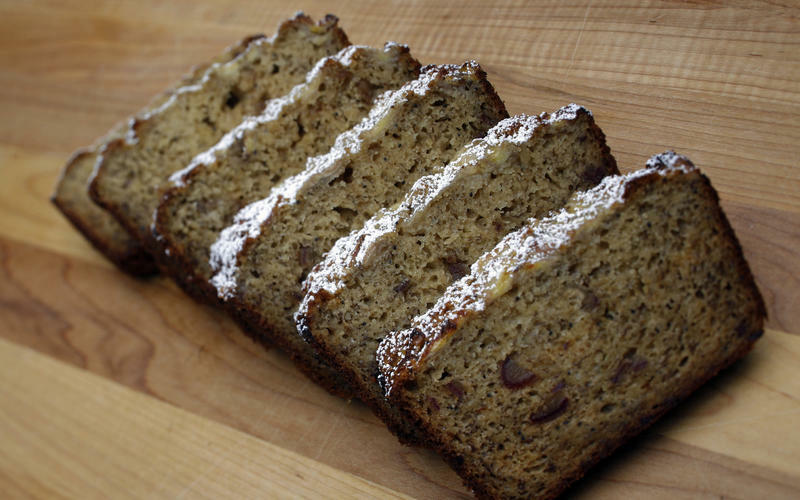 Banana poppy seed loaf is the right choice that will satisfy all your claims.